Film Southasia is an organization which has been supporting and showcasing Southasian documentaries since 1997. The Film Southasia festival is held every two years where the best documentaries of the region are screened. The eighth edition of the fest is to be held from 29th September to 2nd October 2011, here in Kathmandu. ‘Saving Dolma’ a documentary from Kesang Tseten is one of the 36 films participating in this year’s festival. 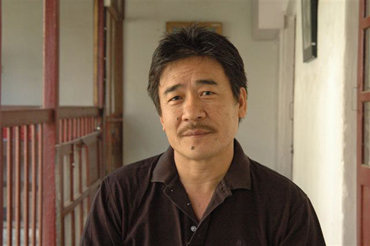 Kesang Tseten is a filmmaker based in Kathmandu and has been making documentaries for more than a decade now. The award winning writer and director has made documentaries like Saving Dolma, We Homes Chaps, In Search of the Riyal, We Corner People, Lepchas of Sikkim, Listen to the Wind, Frames of War and Machhendranath. We Homes Chaps was featured in Film Southasia’2001 and now ‘Saving Dolma’ is participating in Film Southasia’ 2011. As a nonfictional filmmaker what sort of challenges did you face over the last decade in this genre of filmmaking? Kesang Tseten: So were, ‘In Search of the Riyal’ and ‘We Corner People’. The biggest challenge is the filmmaking itself: how to find the right treatment for the particular subject that means knowing what and how to film, and how to edit, in the shaping of a film. The subject is different each time, with its own discussion, your own understanding and feelings about it, so how to find the film, to tell the story, is the challenge that returns each time. Do you think that Film Southasia has succeeded in popularizing documentaries in our region? Your films ‘In Search of the Riyal’ and Saving Dolma’ tells the stories of migrant workers in the Gulf. Explain their influence upon you. Kesang Tseten: It is basically a David and Goliath story, where people ‘ and poor people ‘ go to the richer powerful country; they both need each other, but the rich one can play off the poor more than the other way around. However, it is more complex as there are many shades of good guys and many shades of bad guys. We can’t demonize ‘them’, the Arabs, or whatever, as a lot of problems are rooted here itself, caused by manpower agents, government policies, the wages here, one’s own people or even relatives. Many have a hand, and so it is a challenge to show these realities accurately. How to show these and not distort or misrepresent or be unfair to anyone; how not to be simplistic: So I’m influenced by peoples’ stories and experiences that point to a web of complexities that pervade the phenomenon of migrant workers. I guess empathy for these common people is the constant feeling while making these films. What was the biggest challenge that you faced while making ‘Saving Dolma’? When did you first hear of Dolma? When you first met her did she readily agree to let you film her story? Kesang Tseten: The challenge was the difficulty of access, to Dolma, to the women working in Kuwait, as I couldn’t go there. So I had to depend on footage that was gotten by other people, some of which was very good, but they too had limited access. Also, how to tell a story using the single example of Dolma, sentenced to death and sitting in death row (subsequently, her sentence was commuted); how to tell such a complex and personal story without delving too deeply into the personal, and how to make it work so it conveys the general condition of women domestic workers. Documentaries normally do not achieve commercial success. Have you ever thought of making mainstream commercial movies? How have you been managing the funds for your films? Kesang Tseten: I have been lucky to get funding regularly for all but one of my films. The Swiss Agency for Development Cooperation (SDC) has been very good, Helvetia’s, too, in funding the films and giving me a free hand to do it anyway I see fit. That kind of freedom is rare. I have also gotten grants from the The Jan Virjman Fund and the Pusan International Film Festival which are given on a competitive basis. Has the audience of documentary films grown over the last 10 years? Do you use facebook or other social media to reach your audiences? How can they get access to your films? Kesang Tseten: I’m sure the audience has grown, thanks to several film festivals (FSA, Kimff, some others and lots of opportunities for screenings, but it would be wonderful if television slotted documentaries on a regular basis, real documentaries, not reportage and news features. They do but we have to pay for it at present. Then it would reach a huge audience. I don’t use social media all that much except to put up notices for screenings. I guess I’m not such a great marketer. What inspired you to follow the lesser popular style of filmmaking? Are there other filmmakers who inspire you? Kesang Tseten: I don’t know what is popular and what isn’t. I think about my subject, film in a way that I think is suitable, or often, I don’t have a plan but film as a way of research, and then see how to solve the puzzle, of finding the best vehicle for the material. Most times, it’s the material that suggests the form. There are lots of inspirational figures such as, these days, Frederick Wiseman, who makes long observational films about American institutions (Titticut Follies, Near Dying, High School), the Maysles (Salesman, Grey Garden), Erroll Morris (The Thin Blue Line, Gates of Heaven), Ross Mcelwey (Sherman’s March, Time Indefinite), and many more. Three other films from Nepal have are being showcased in the upcoming festival. Have you watched those films? What is your opinion of those films? Kesang Tseten: I haven’t watched the other films from Nepal and don’t know about them. What is the condition of independent filmmaking in Nepal? Do the independent filmmakers of Nepal meet and exchange ideas on a regular basis? Kesang Tseten: Independent means different things at different places. If you mean, a film’s content and form that is produced free from sponsor’s interest, I think that is happening, to some extent but not alot because there isn’t funding to support that, and also our capacities. We tend to be influenced by the issues that have funding interest, which is to be expected as who can make a film out of his or her own pocket, but that’s the situation. That and the fact that we are fairly new to this kind of expression, or not as developed, given the lack of practice and experience. We tend to know each other, filmmakers, that is, but there isn’t a thriving discussion or scene going on, I don’t think. I suppose it will happen when we are ready for it.